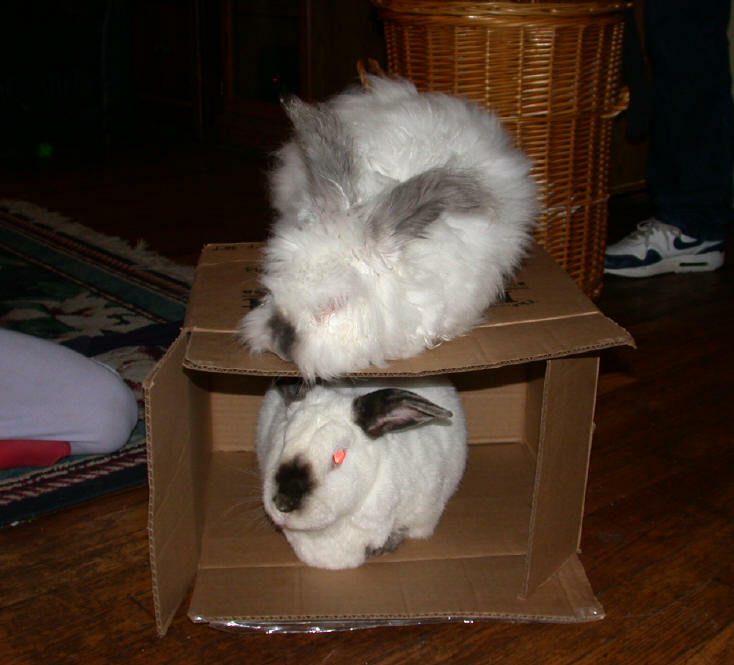 On January 9th, 1999 there were some bunnies brought to my attention by a member of Petbunny. The Ashtabula Humane Society had confiscated many bunnies from a shed. These bunnies had no light at all and were only being fed every few days. The woman for the Humane Society brought 3 of the adult bunnies to my home and I adopted Big Bunny and Vincent. Within a few days, 3 of the females gave birth to litters. Sadly, 1 of the mothers litters didn't make it. 8 weeks later, Natasha from the humane society brought all the baby bunnies to my home. I adopted one of the babies and we named him Daffy and our home of bunnies was set. 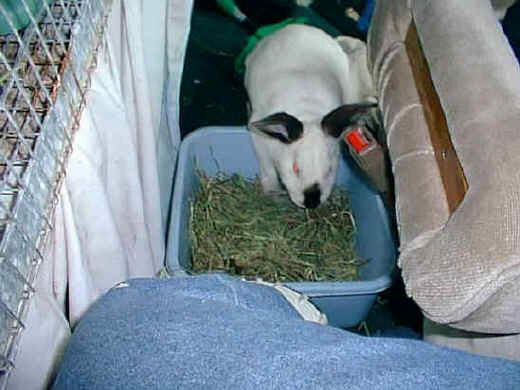 On June 13th, 1999, I drove to Toledo to pick up 2 bunnies from the Michigan Rabbit Rescue. 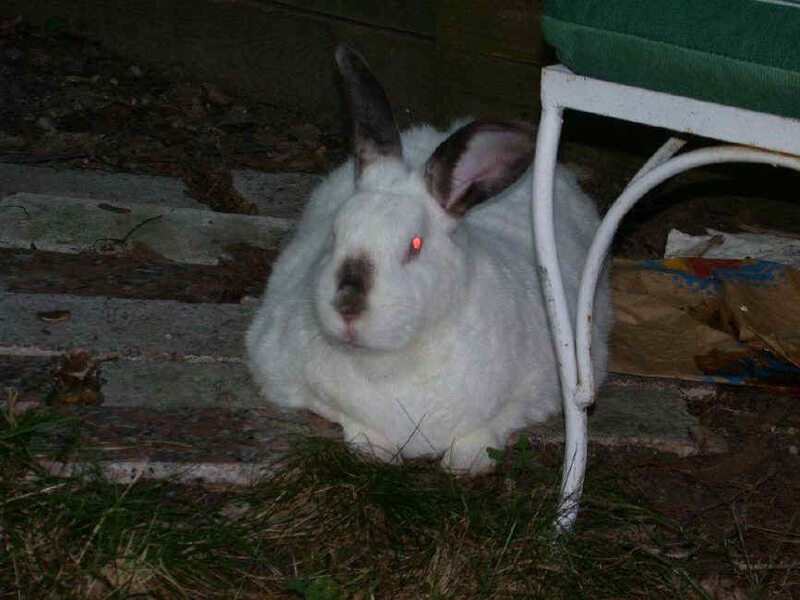 It turns out, 1 of the bunnies I was going to get was Big Mama. She was the mother of 1 of the litters. She had been taken in by MRR and was being fostered there. On 12/16/99, Big Mama went to the bridge. 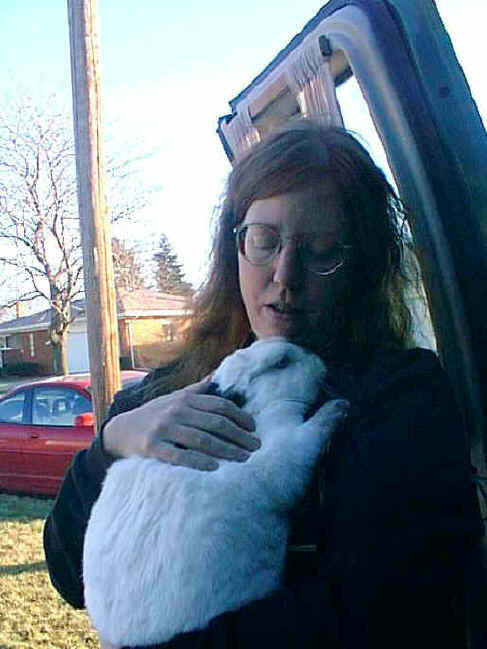 About that same time, a woman in Ohio contacted me looking for a large bunny. 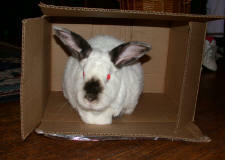 I first went and checked out the Buckeye House Rabbit Society page but I did not see any large bunnies. I then went and checked out the MRR and Warren Rabbit House Sanctuary sites to see what they had. 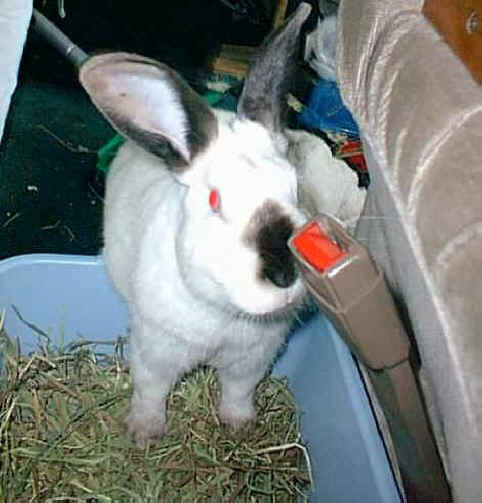 On December 23rd 1999, I was looking at the MRR web site when I realized that they had a bunny named Thunder. 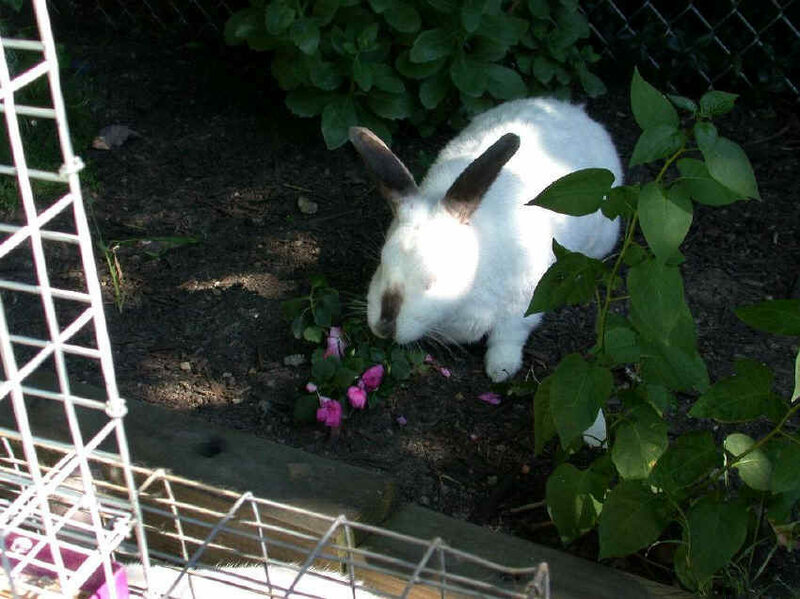 This bunny was the last one from the Ashtabula group that had not yet found a permanent home. Thunder is the Baby of Big Mama and Big Bunny. 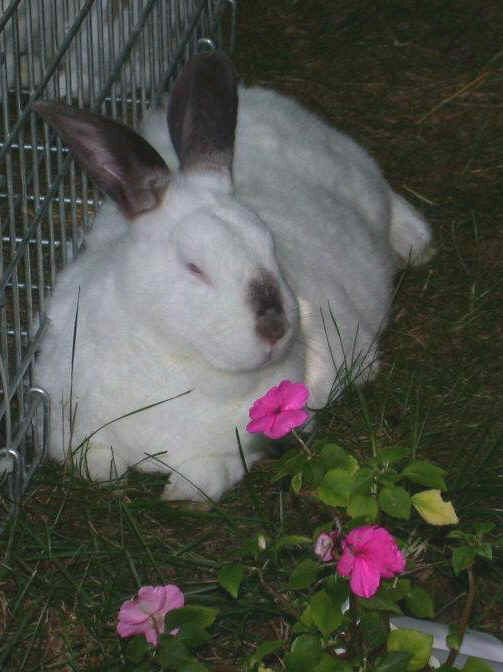 I immediately emailed Linda and told her I wanted this bunny. I just felt this bunny belonged here with me and the rest of his family. 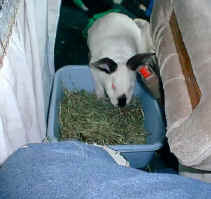 On the weekend of 1/8/2000, my husband and I drove to Michigan to pick up Thunder. Thunder was very scared when we brought him home. He would grunt and lunge if you tried to get near him but once picking him up he settles right down. It took close to a year of Thunder being by himself to really get him to settle down. We took bonding with him very slow because he was still really scared and we didn't want to terrorize him. My bunnies all live indoors but on nice days, I sometimes take groups of them into my fenced in backyard and let them run around while being watched at all times. 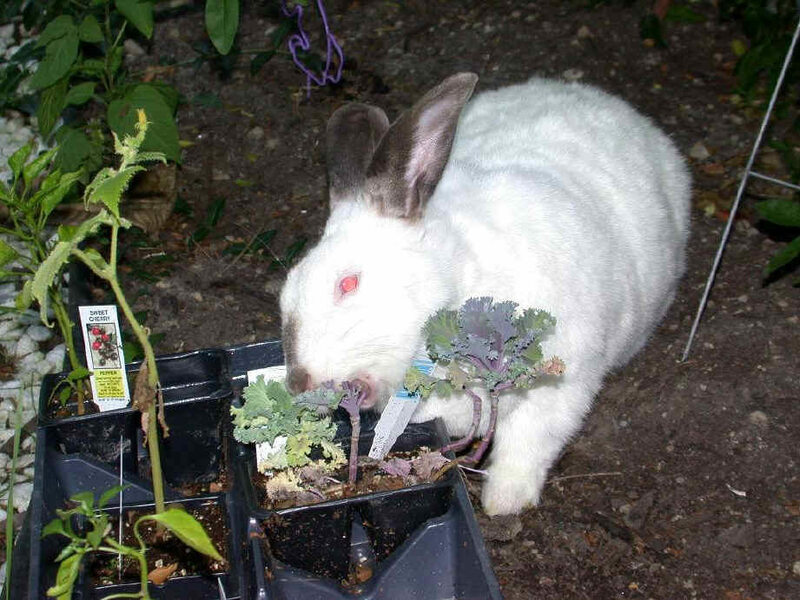 Thunder helping himself to the purple cabbage before we could even get it planted. Thunder lived a long and winding road. He started out with a rough life and did a lot of traveling, but in 2000, he made a full circle and came back home. I was so happy to have Thunder with me, although he was very loud in shouting and snorting his dislike of everything! lol Once we finally got Thunder to calm down and trust us, he because a great big love bug and you could mush and smoosh him with hugs and kisses and he just accepted it all. 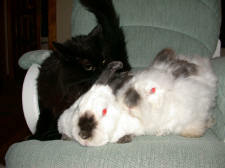 He also learned to live with the other bunnies and with my cats. He was a wonderful bunny and it was very sad when we lost him in 2/05.